Another opportunity that we can earn money! Hello Guys, First of all, I really thank you for Coinsmo New Year 2018. I'm making things more according now with good management of my investments in cryptocurrencies. Now, its 2018 and there will be a new opportunities to come for us. What we need to do is to learn, discover new things and explore. BitConnect has been proven and really amazing last year 2017. And we finally have the new product of BitConnect, a new ICO BitConnectX. As I analyzed it, figuring out what will it be, I strongly assumed that this is an Crypto Exchange. It accept BCC, LTC and BTC as you can see it in the image below. I really believe that this will be a big one again for BitConnect. Look, they have their strong lending platform and now they will going to have this Exhange. Can you imagine how much money you can earn with this if your going to buy this ICO. BitConnect is already a strong and trusted platform that is available to join start investing to earn money. 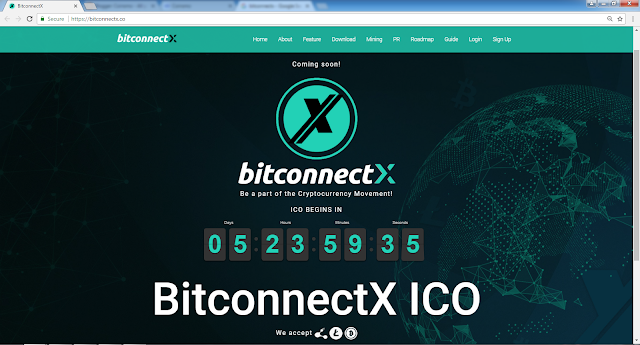 You can see here on How To Earn Money With BitConnect.